Game development is a tough business. Working with a team to execute a specific creative vision, on time, and have it welcomed with loving arms by the community is a monumental task. That is why we are creating Kinguin.io — a unique decentralized platform to help developers where they need it most. First of all, wow — $7 to games that don’t even sell. Second, while $4 for distribution seems insignificant, that adds up. Heck, you can still get a filling meal for $4 in some areas. At any rate, digital distribution of games takes out that $11 cost. Now, most gamers have an idea or two for a game they’d like to see get published. Some of us take it a step further and look into what it would take to publish a game ourselves. If you haven’t considered publishing a game, maybe the figures above will encourage you to pick up a new hobby and make some extra cheese by making your own game. But if you have considered publishing a game, or have published one already, then you may know there’s much more to the story — that the market factors which affect game publishers really affect all gamers. This is the story of Dave the developer and his quest to publish a first-person shooter tentatively titled Dawn of the Bots. So-called AAA games like Witcher 3 cost in the tens of millions of dollars to “make.” And even for indie developers like Dave, out-of-pocket expenses rack up rather quickly. The cost of developing, distributing, and marketing a game is the three-headed monster developers historically have had to content with. They have done so with pretty creative solutions, some of which have spawned entire new market factions. One such solution, crowdfunding, was among the bests way to fund an ambitious gaming project as recently as a few years ago. It’s still a viable option, and why not try it — especially if you think your idea could go viral. Most famously, the indie-developed space simulator Star Citizen has received more than $175 million in funding through the site. It seems like anyone could make a good game with that kind of money. But even those few rare projects that manage to blow past their funding goals encounter new problems: specifically, how to scale to meet increased expectations. Star Citizen has toiled in production hell for years, and many of their fans have turned into legal opponents in court. Beyond that, the fact is that there will — at least for the near future — continue to be significant costs associated with the development of video games (and that’s before we even take into account what it’s like to deal with today’s game publishing companies). For developers like Dave or yourself, the same impetus that has lowered the costs of buying games on Kinguin.net also will drive down the price of publishing your own video game on Kinguin.io. By decentralizing our entire platform with blockchain technology, we are making gaming better for everyone, including game publishers. In fact, we are solving at least three major problems in the value chain for game publishers. Ask any developer and they’ll tell you: the major gaming companies take too big a slice from the revenue pie, and then they go back for seconds…and thirds…and fourths. The sad reality is that this is the status quo in today’s video game market. Game publishers are like dinosaurs that wreak havoc on the value chain and leave indie developers to forage for scraps. Representatives from these companies make a habit of hedging on new projects rather than going “all in” for game publishers. Have you ever spoken or tried to speak with customer service from a large corporation? Then you understand just how frustratingly difficult it is to even contact representatives from major game publishers, much less negotiate fair revenue-sharing terms, if you’re a game developer. Plus, negligence towards game developers has always gone under-reported in the media, which concerns itself more with big numbers and larger audience segments. For every dinosaur there’s a comet. While game publishing platforms aren’t likely to go extinct anytime soon, blockchain technology opens up a future full of new possibilities for us, the gamers and game publishers. As part of the Kinguin.io publishing platform, developers get access to a flexible payment gateway cryptographically secured on the Ethereum blockchain. You know from the infallible, provable quality of the blockchain that you’ll get paid for whichever game you decide to publish. - The technology which supports the smart contracts which fund his game is made cryptographically secure against cybercrime. - The values of the startup which supplies that technology put Dave first. That goes for our 96% customer satisfaction rate through customer support, and also for our fair value sharing ethos. - Dave knows it will be very easy to access historical records of transactions taking place on the platform. Market forces such as the cost of distributing a game hinder value creation for developers. Dave spent several thousand dollars and hours to produce Dawn of the Bots and wants to see a sizable return on his investment. Unfortunately for Dave, the status quo in the gaming market is such that developers must re-up their investment in order to distribute their game. Worse yet, these indebted developers often must pick the payment model preferred by the distribution platform (as opposed to the payment models they themselves prefer). Depending on his marketing strategy, Dave may opt for any of these five payment models with the confidence that he can pivot to a different payment model. Developers distribute games with no protection against malware and corrupted software. This problem has two sides: the uncertainty surrounding game publishing hurts both gamers (who lose out on awesome games, or else download corrupt files on accident) and developers (less sales). Developers looking to earn Krowns through game sales by necessity concern themselves with their reputation amongst Gamers. The second a game download link goes corrupt, that incident tarnishes the reputation of the developer behind the game. Right? You’re correct to be wary of untested download links distributed or pirated on untrusted domains. Moreover, gamers like you and also developers like Dave have concerns that extend beyond status as an upstanding member of the gaming community. Simply put, everyone will receive more Krowns if transactions between gamers go smoothly. Dave learns he can distribute his game digitally through Kinguin.io’s peer-to-peer download client. This download client is secure against all different kinds of malware and corrupted software. Each download contains file hashes which match exactly the original master copy of the game. Dave is able to track incoming Krowns through his Kinguin.io wallet and gather feedback through comments on his game. In the previous use cases, we have seen how Dave the developer stands to benefit from at least six distinct payment models. If and when Dave publishes a game, interested Gamers can test out the gameplay for free, pay as they go, or buy the title all at once — depending on which payment method Dave chooses. But how are games actually made? There is at least one developer behind each game, yes — and also possibly a second developer, a third developer, often a graphic designer, perhaps marketing and administrative personnel, and so forth. At present, the number of employees on a team correlates to significant overhead which can turn into a headache on the publishing side of things. Consider the problem of payment distribution. As things stand, it costs creators precious time and money to distribute pay to each member of the team. Let’s say Dave employs six people. In order to compensate his co-workers, Dave must go through an obstacle course of forms, collect these people’s private information, double-check balance sheets, and perform other interrelated tasks which take away time he wants to spend making the game itself. The only existing alternative for Dave is to employ an administrator, which saps the overall budget for the game. Solution: Smart Contracts Completely Turn The Tables On Traditional Structures For Pay Allocation. 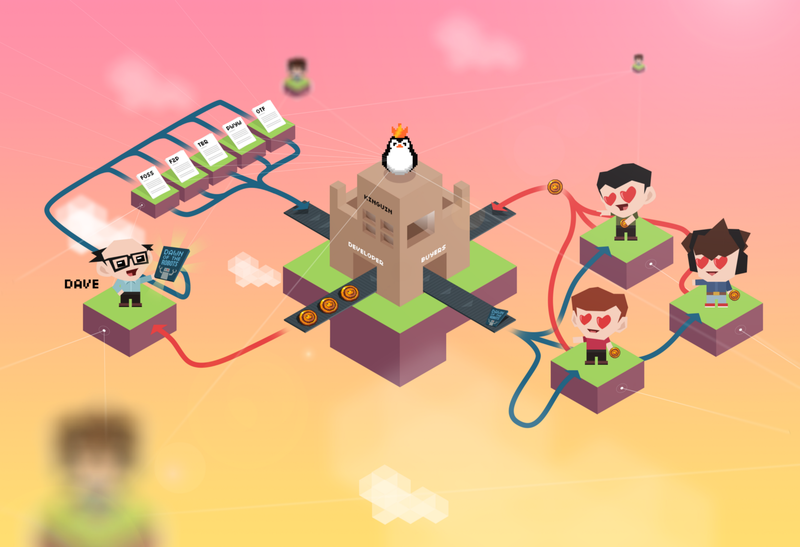 With a smart contract in place, the seven members of Dave’s team each get paid the proportion of the game’s revenue which corresponds exactly to their salary. What’s more, these payments occur almost instantly and at precisely the same moment in time. This means no more waiting several days for payments to process, an improvement which especially suits remote teams whose finances may in the past have had to cross national boundaries. Theoretically this project manager and freelance specialist could work together on the same game, receive their salaries at the same time, celebrate paydays together — all without incurring administrative costs of time or money. We’ve seen how developers like Dave or yourself stand to gain from joining the Kinguin.io platform. 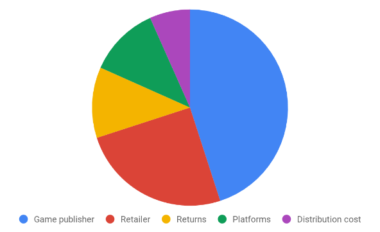 Trustless distribution in particular ratchets up earnings potential for game developers and publishers of all shapes and sizes. But it’s not just game developers and publishers who can earn Krowns — all value creators with some effort can make a living on the Kinguin.io platform. You can even earn value from making a funny comment on a stream. And who knows? Maybe one of those comments expands your gaming network into a group of professionals.